Who knew that Starship Troopers is a more divisive topic than the Winnie Cooper vs. Topanga debate? You know. That debate that so often takes place… in my head. Winnie Cooper usually wins. In my head. Debates are always fruitful, however (especially when we can all come to the logical conclusion that I’m completely correct… and handsome), and today was no different; here are three more cinematic geek let-downs. Back before we came to know Dean Devlin and Roland Emmerich as the pair who are guaranteed to deliver mind-numbingly stupid movies built on epic concepts and epic visual effects (The Day After Tomorrow, The Patriot), they were just the guys who had given the world the pure, escapist fare of Independence Day. For their follow-up project, they took on the biggest movie monster of all time. 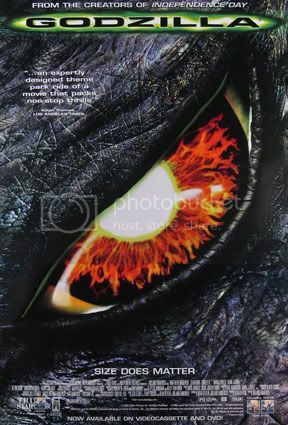 After months of hype and anticipation, when a giant lizard beats the hell out of New York city and the response from audiences is a collective yawn… you might be a redneck. No, wait… you might have a huge stinking, disappointment of a movie on your hands. And in spite of everything, someone keeps giving Devlin-Emmerich gobs of money to make more films! I’d be more comfortable giving those hundreds of millions of dollars to Blackwater contractors to teach anger management classes to convicts. Predator: one of the best action sci-fi action movies, ever. 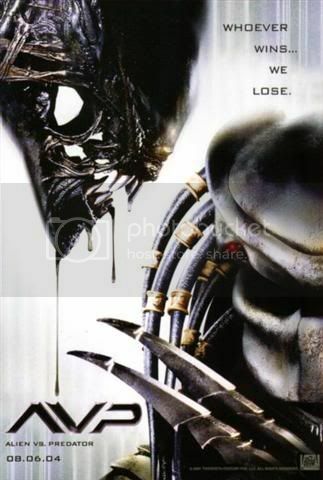 Alien: one of the best horror/suspense movies, ever. Let’s make a mutha’-humpin’ mashup, people! The Live Free or Die Hard syndrome: a PG-13 movie for subject matter and characters that demanded to be rated R. They should have just called it, Alien vs. Predator: Ouch! This Alien Seed Growing in My Chest Is Unfortunate! Clearly, producers are changing gears for the upcoming sequel, which is embracing its rated-R-ness. And, boy, do they want you to know it. If you haven’t seen the trailer… chuck about a hundred water balloons filled with fake blood at a group of screaming, half-eviscerated, unfortunate bastards, and you’ll get the idea. Iconic geek toys brought to life through the magic of modern Hollywood visual effects. Oh, oh! 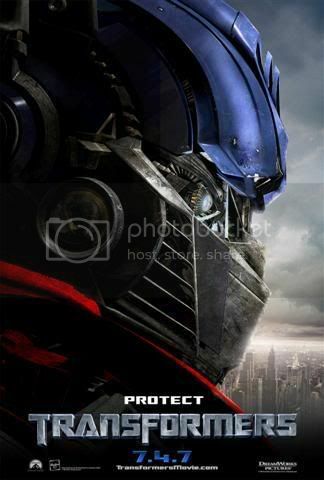 And Peter Cullen, the voice behind Optimus Prime in the original cartoon, is reprising his role for the movie! I won’t bend your ear with the litany of flaws afflicting this movie. I already did that–and then some–in my Transformers movie review. Instead, I’ll sum up the problem with one name: Michael “Boom Boom” Bay. Now that I think about it, that sums up the underlying issue with a lot of things I have a problem with. Armageddon… Pearl Harbor... the crisis in Darfur… our national trade deficit… the list goes on. Really what’s upsetting is that if you line up most “geek” movies, you’ll find that on balance they are disappointing. Why is it so hard to make a decent scifi/fantasy/tech-driven-killfest movie? 1) Whoa, Winnie Cooper all growns up now. Impressive. Thanks for the visual. Added to the memory bank. Aliens, Aliens 2, Quick and the Dead, Terminator, Hard Target, etc., etc. I really hope they jam him into the new one. Nathan, I have to disagree. Some geek movies are incredibly satisfying. Batman. Spider-Man. X-Men… you know, if you’re drunk. Fatmoon, unfortunately they’ve confirmed that Lance will not be in the new one. I think they could have totally pulled it off with the “He’s a clone of the guy in the last movie who was the human the androids from the original movies were based on.” route. 1) Winnie cooper has always grossed me out. Uh oh, Paul. You lost me after (1). lol I don’t know what it is about her. Her face has never seemed attractive to me. Its the same thing with Drew drew barrymore or Reese Witherspoon. I just can’t seem to dig them. So, I think people who liked the Starship Troopers FILM, have simply never read the book. One of the best sci-fi novels ever, and so few have read it…. things I loved about the book that made the movie horrible for me. 2. Power Armor, the entire book revolved around it how baddass is POWER ARMOR!?! 3. “Cap” Troopers = Capsule troopers, as in they are shot out of a ship encased in capsules like machine gun rounds, in their power armor. 4. Best action sequences EVER in the book, and they just don’t translate without power armor. 5. Humans were retarded in the movie, and had no idea what they were doing, in the book they were smart, bugs were just as smart. Anyway, read the book, then tell me it was a good movie… I strongly agree with great white on that one (in fact, I think it was friday, that I said someone should make a “real” Starship Troopers movie). I have read the book and dude, it would make a boring movie. Half the book is dissertation on capital punishment. And do you really they could have afforded the special effects to have all the soldiers in body armor? The same thing goes for the capsule troopers. I think the biggest mistake with the film was actually tying it in with the book. If it would have been called Teen Commandos Vs. The Bug Monsters a lot more people would have liked it. That way they could make Starship Troopers closer to the book and every nerd could pick that film apart. Teen Commandos Vs. The Bug Monsters certainly would have set expectations a bit better… let’s call a spade a spade. Sorry, but Topanga wins every time. And Starship Troopers wasn’t too bad. I loved the campy-ness of it, especially the little ads in-between scenes. No, I haven’t read the book. I just grew up watching Boy Meets World. And yes, she kinda let herself go. Hah. Fat girls wear sweaters. Winnie Cooper doesnt.